This article is about Datu Muhamad Saleh (Mat Salleh) and his leadership in a series of armed resistances against British colonial rule. For other uses, see Mat Salleh. His revolts were widely supported by the local communities and affected a large geographical area from Sandakan, across Gaya Island, including the interior, especially Tambunan. :p.190 His most notable uprising occurred at midnight on 9 July 1897, when he led his followers to successfully attack a major colonial settlement on Gaya Island. Mat Salleh was born in Inanam. :p.190 His father was Datu Balu, a traditional leader in Inanam and a member of the Suluk community. His mother was of Bajau descent. :p.189–190 He had three siblings: Ali, Badin and Bolong. The family moved to Sugut, which unlike Inanam, was in the Company's concession but since the abandonment of its tobacco estates, it had reportedly been "left largely to its own devices",:p.47 and enjoyed relative autonomy. There, Datu Bulu assumed a local leadership position along part of the Sugut River on the eastern coast of North Borneo. This is, apparently, the only known available photograph of Mat Salleh (marked with an white "X"). 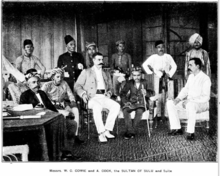 W. C. Cowie, Managing Director with the Sultan of Sulu. Poll-tax and passes for boats on local communities,:p.190 including members of the local elites and traditional leaders. Passed a Village Ordinance, resulting in the Company not sanctioning the authority and traditional social position of a large number of traditional elites and local chiefs. :p.190 This consequently alienated them and undermined their roles and social statuses. The Company had set up its initial administrative centres on the west coast of Sabah in Papar and Tempassuk. In between these areas also stood the Gaya station,[note 4] set up in September 1882 as a collection station for jungle and local produce. This station also served as a "stopping place" for European officials plying between Kudat and Labuan. :p.1 Gaya Island was initially thought of as a highly prospective settlement site and a possible port of call. It later however, did not flourish as expected; trade, collection of local produce and other economic activities did not prosper. :p.1–5:p.34 After the station in Gaya was raided and torched by Mat Salleh and his followers in July 1897,[note 5]:p.35 the British relocated to the mainland, in Gantian. Mat Salleh first came to the Company's attention when he was suspected of involvement in the murder and robbery of two Iban traders on the Sugut River in 1894.:p.48 Captain Barnett and a few other colonial officials were sent to Mat Salleh's residence to investigate the matter. [note 6] Mat Salleh denied his and his followers’ involvement in it and resisted arrest. :p.862:p.8–9 This incident marked the first of many misunderstandings, creating a tense and hostile situation between both parties. After the successful attack on Gaya Island, Mat Salleh and his followers moved on to a fort on the Soan on the Labuk, then Parachangan on the Sugut, then proceeded to attack and burn down the government residency at Ambong:p.862 in November 1897. This was also the last fort he used for defence in his struggle to rebel against the British. This Oath Stone was erected by the Company in January 1898 "as witness of the oaths of loyalty" taken by Mat Salleh, his followers and other Ranau natives after a peace pact was agreed on. This was Mat Salleh's Mandau, which he had surrendered to Cowie as a symbolic act of his acknowledgement of the North Borneo Chartered Company's authority after the peace agreements.In some accounts, Cowie had then "graciously" returned it to Mat Salleh as a gesture of their friendly terms. That he be allowed to stay at Inanam. 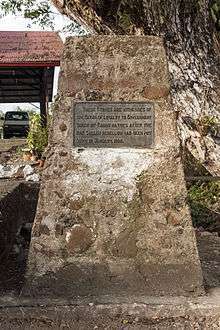 Memorial Stone near Tambunan, Sabah, Malaysia, marking the former location of Mat Salleh's fort and also the place where he met his death in 1900. The Company sent a force to retaliate. They reached Tambunan 31 December 1899 and fighting commenced the next day. On 10 January 1900, the Village of Laland was lost to the Company. Mat Salleh lost 60 men. 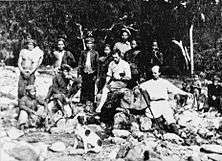 On 15 January 1900, the Company proceeded to acquire Taga villages and the fort of one of Mat Salleh’s chief lieutenants; Mat Sator was burned by shell-fire. They then cut the water supply to Mat Salleh’s fort by diverting the Pengkalian river to the Sensuran. On 27 January 1900, Mat Salleh’s own fort was seized and shelled continuously for the next four days. The seemingly impenetrable fort finally fell due to a massive onslaught by the Company, and with this, Mat Salleh's final defences were finally broken. Mat Salleh Memorial near Tambunan, Sabah, Malaysia. This plaque marks the site of Mat Salleh's Fort which was captured by the North Borneo Armed Constabulary on the 1st February 1900. During this engagement, Mat Salleh, who for six years led a rebellion against the British Charted Company administration, met his death. 1 2 3 4 Sources conflict about the end date of the rebellion. Some state 1903, others 1905. ↑ Some of his supporters believed he possessed supernatural powers that made him invulnerable to physical harm and the inability to be hurt or killed by conventional weapons(typically known as Kebal in the Malay language). Even, invisibility so as not to be seen by his enemies. For many, his ability to repeatedly evade the Company's attacks served as proof of these claims. ↑ Some symbols that he used were enormous silk umbrellas (high society), insignia of royalty, and even inscriptions that were apparently believed to make him invincible. ↑ Gaya Island (along with other locations in the west coast of Sabah) was acquired by the British through an agreement with the Sultan of Brunei, Sultan Abdul Mumin Ebn Marhoum Maulana Abdul Wahab on 29 December 1877. ↑ Some British colonial sources claim that the abandonment of Gaya was not entirely caused by Mat Salleh. After the raid, the Company attempted to rebuild the township. However, it failed to economically flourish. Also, the company's railway project (above-mentioned under changes imposed after the arrival of the British North Borneo Chartered Company's arrival) that were started in 1896 had reached a stage where a suitable exit point was needed at the end of the line from Beaufort and Weston. As Gaya is an island, it had to be ruled out, and a new site had to be found on the mainland. With the acquisition of new territories from Brunei. There were also many new and more suitable sites to choose from. ↑ Some sources claim that Captain Barnett and his men were sent to confront, accuse and detain him. During this confrontation, Captain Barnett had attempted to forcefully apprehend Mat Salleh, but was outnumbered by his followers, ready to take up arms to protect him. Mat Salleh came peacefully and apart from presenting his petition, meant to clear his name and settle the misunderstanding regarding his involvement in the Iban murders. Instead, he was treated with hostility by then present treasurer-in-general Alexander Cook, who then turned him away, causing much embarrassment to Mat Salleh. Mat Salleh arrived with an armed entourage of boats to present their petitions detailing their grievances towards the company. In the absence of Governor Leicester P. Beaufort, Cook, petrified by the show of force, requested through a representative that Mat Salleh and the others tender their petition in a formal manner and instructed them to disperse. There was a delay in relating this message and Cook’s request only reached Mat Salleh after he had waited for two days. ↑ Other accounts state that the reward was Straits $700. ↑ In some accounts, there was a discrepancy between the verbal and written agreement. Only when the written agreement was sent did Mat Salleh realize that he had been denied the pardon of his men who were escaped felons. Mat Salleh felt deceived and began to secretly strengthen his position in Tambunan. ↑ In the process of building a telegraph line, two new stations were established in the interior: one at Sapong in 1895 and another at Keningau in 1896, each under the European officer. The appointment of F W. Fraser at district offices at Keningau in 1898 signalled the extension of company rule to Tambunan. ↑ Some claim that Mat Salleh did not die during the Tambunan attack. 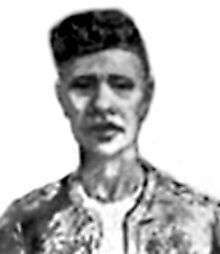 In an interview conducted by a reporter from the Malaysian newspaper Bernama, Petrus Podtung Kuyog, 73, the grandson to one of Mat Salleh's followers strongly asserted that according to his grandmother, Giok's account; on 31 January 1900, Mat Salleh survived the attack and fled with his wife before going into hiding. His deputy was killed and was mistaken by the Company for Mat Salleh. 1 2 3 Wong, Danny Tze Ken (2004). Historical Sabah: Community and Society. Kota Kinabalu: Natural History Publications (Borneo). ISBN 9838120901. 1 2 3 4 5 6 7 Wong, Danny Tze Ken (Dec 2007). 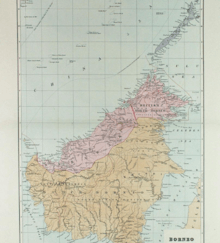 "From Gaya to Jesselton: A preliminary study on the establishment of a colonial township". Borneo Research Journal. 1: 31–42. 1 2 3 4 5 6 7 8 9 10 11 12 13 14 15 16 17 18 19 20 21 22 23 24 25 26 27 28 29 30 Singh, Ranjit D. S. (2003). The making of Sabah 1865-1941: The dynamics of indigenous society (2nd ed.). Kuala Lumpur: University of Malaya Press. ISBN 9831001648. 1 2 3 Gill, Sarjit S.; 2007. "Sejarah Penglibatan orang Sikh dalam pasukan constabulari bersenjata Borneo Utara, 1882-1949 dan kesan terhadap identiti". Jebat (in Malay). 34: 49–70. 1 2 3 4 5 6 7 8 9 10 11 12 13 14 15 16 17 Ooi, Keat Gin (2004). "Mat Salleh Rebellion (1894-1905): Resisting foreign intrusion". Southeast Asia: A Historical Encyclopedia, From Angkor Wat to East Timor (3 volume set). ABC-CLIO: 862–863. ISBN 9781576077702. 1 2 3 4 5 Zainal Abidin, bin Abdul Wahid; Khoo Kay Kim; Muhd Yusof bin Ibrahim; Singh, Ranjit D.S. (1994). Kurikulum Bersepadu Sekolah Menengah Sejarah Tingkatan 2 (in Malay). Kuala Lumpur: Dewan Bahasa dan Pustaka. ISBN 9836210091. 1 2 3 4 5 6 7 8 9 10 11 12 13 "Mat Salleh". Sambutan kemerdekaan. Kementerian Penerangan Komunikasi & Kebudayaan. Nov 2011. Retrieved 12 November 2012. 1 2 3 4 5 Tarling, Nicholas (Mar 1985). "Mat Salleh and Krani Usman". Journal of Southeast Asian Studies. 16 (1): 46–68. doi:10.1017/s0022463400012765. ↑ Fernandez, Callistus (Dec 2001). "The legend by Sue Harris: A critique of the rundum rebellion and a counter argument on the rebellion". 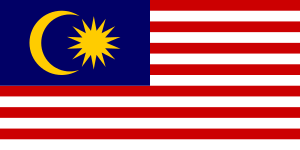 Kajian Malaysia. XIX (2): 61–78. 1 2 3 4 5 Wookey, W. K. C. (Dec 1956). "The Mat Salleh Rebellion". Sabah Museum Journal. VII. 1 2 3 4 5 6 7 8 9 10 Shuhada, ed. (1997). Mat Salleh: Pahlawan Sabah (in Malay). Kuala Lumpur: VC. ISBN 9830800385. 1 2 3 4 Joseph Binkasan; Paskalis Alban Akim (2000). "A permanent tribute to one of Sabah's earliest freedom fighters". Reprinted from the New Straits Times, Thursday, 9 March 2000. Malaysian Museums. Retrieved 13 November 2012. 1 2 3 4 5 Thiessen, Tamara (2008). Kara Moses, ed. Borneo: Sabah Brunei Sarawak. Guildford: Globe Pequot Press. ISBN 9781841623900. ↑ Luping, Herman J. (1994). Sabah's dilemma: The political history of Sabah. Kuala Lumpur: Magnus. ISBN 9839864009. ↑ Mansor, Nashir (31 January 2006). "Mat Salleh, The Man Who Antagonised The British" (Reprinted from newspaper article published by Bernama, 31 Jan (Year)). Bernama. Retrieved 17 November 2012. Visit the Memorial (, , ). Read about an official biographical movie on Mat Salleh. Watch a fan video on Mat Salleh's life (part 1 / part 2). This entry mentions many parts of Sabah. Refer to a map of Sabah to follow Mat Salleh's movements throughout the rebellion.